Practice makes perfect and pepper spray deployment is no exception. 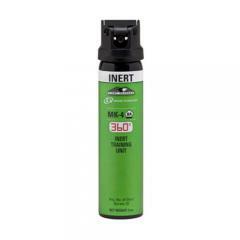 The First Defense® 360 MK-4 Inert Stream from Defense Technology is a specialized inert spray for law enforcement and tactical practice. The 360 MK-4 features the same powerful stream and functionality that make Def-Tec America's preferred OC spray provider, without the immobilizing effects of an active formula. The canister employs a 360-degree deployment system that allows operators to activate the sprayer from any angle with an effective range up to 10-12 feet. The canister contains three ounces of neutral formula, enough for up to 25 bursts.